How're y'all doin'? I'm sure glad you've stopped by! 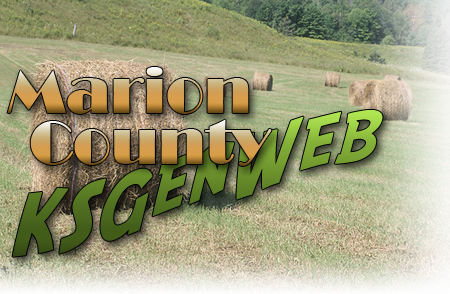 Welcome to the Marion County KSGenWeb pages! My name is Kenny Thomas and I'm the county coordinator for Marion County. I've added a few things to hopefully make your searching easier and quicker! A Drop Down Menu that I hope will allow you to quickly find the pages you're looking for, on each page near the bottom I've placed links to all of the 'main' areas of this Marion County KSGenWeb site so you will always have a link to elsewhere in the site. Plus I've just added an Email Form to make it easier to submit your surnames and/or queries! Please note that I have creating pages for Family Reunion News and Genealogy/Historical Society news! So hopefully, if you have an upcoming Family Reunion or happenings at the local Genealogical or Historical Societies, you'll let me know so I can post it and help you to spread the word! As always, make yourselves at home, browse around, see if there is anything that may help you in your search for your Marion County ancestors. I would also like to ask of you, if you have anything that pertains to Marion County, (i.e., census records, tombstone transcriptions, cemetery records, marriage records, obituaries, etc) that may be of assistance to others. Do you have books or other reference materiel pertaining to Marion County? Would you like to be a Lookup Volunteer? Please give me a holler, I'll be more than happy to help you in anyway that I can! Enjoy your visit! If you have any comments or suggestions, please let me know! Marion County Query Lists Queries submitted from July 1996 through current. Post yours! you never know, you just may make a connection! Marion County Surname Lists This is something that hasn't been used for Marion County in quite sometime, please feel free to submit the surnames you are searching for and let's make this a valuable resource for Marion County! Marion County Family Reunion News Information sent in concerning Marion County Family Reunions. Marion County Query / Surname Entry Form A new twist on the way you can send your surnames and Queries to be posted! Come On, Give it a spin!